Only 1,000 records of this legendary all-time classic,An Ideal For Living EP, from 1978, exist. 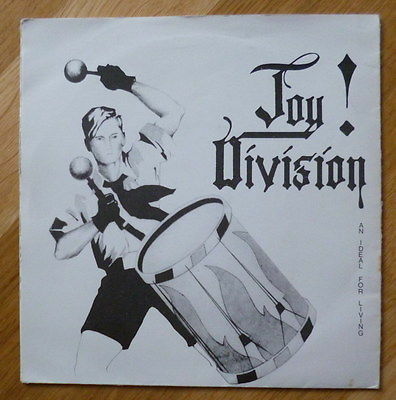 This ultimate JOY DIVISION rarity has it's own place in the history of Punk / New Wave music and the price is increasing rapidly year on year. eBay prices: £4,656 + £2,600 + $3,939. Sleeve and vinyl are in EX/M- condition (very clean, no splits, etc). Believe me you will not find a cleaner one. It has all the important characteristics of an original first pressing. That means the label has a matte finish. There is the all important serrated edge around the label (see second scan). The matrix numbers are handwritten and very small (about 1 mm tall). The poster sleeve is printed on matte paper. Here's your chance to buy the first 7“ release by JOY DIVISION from Manchester, home of the BUZZCOCKS, V2, FAST CARS, FALL and PANIK. As you can see on the picture, there is a 14" x 14" fold-open sleeve for this EP, entitled, ‘An Ideal For Living’. The upper left segment shows a figure resembling a Hitler Youth, but the band may have seen it as more exemplifying the notion of "Music By Youth" and the EP's title, the lower right segment is from the famous picture taken during the 1943 uprising in the Warsaw Ghetto. All the 1,000 poster sleeves were folded, by hand, by the band. Released on their own 'Enigma' label. The A-side matrix number is PSS-139-EP-A-1-EG. The matrix number on the flip is PSS-139-EP-B-1-EG. This 4-tracker features two brilliant `77 punk classics, ‘Warsaw’ and ‘Failures Of The Modern Man’. The other two songs featured are the, equally, superb‘Leaders Of Men’ and, the well-known, ‘No Love Lost’. This one is the holy grail for any Joy Division, New Order, Factory, Gothic, Punk and New Wave collector. Again, you will not find a cleaner one. Of course, I will send the record insured to its full value. Good luck.